Double-click the desired task in the Task View window. Right-click the desired task in the Task View window to see the shortcut menu, and then click Properties. Select the desired task in the Task View window, click the File menu, and then click Properties. Select the desired task in the Task View window, and then press ALT-ENTER. 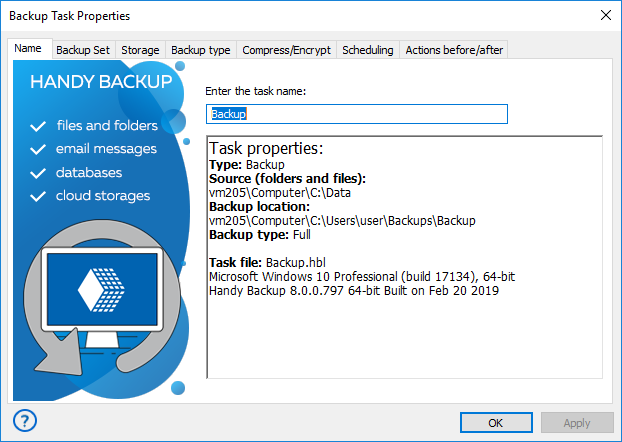 Task properties are divided in six (for unencrypted Restore and Synchronize tasks) or seven (for Backup and encrypted Restore tasks) tabs by categories. Action tab contains settings that allow performing certain actions before or after executing the task. Other tabs contain settings assigned during task creation. Task creation is performed with the help of the New Task Wizard and is described in details in Managing data with Handy Backup.